The magazine. was founded as a quarterly in July 2002, and was owned, by Josh Jackson, Nick Purdy, and Tim Regan-Porter. It later switched to a bimonthly format. In 2005, Paste fulfilled remaining subscriptions for the competing magazine Tracks, which had ceased publishing its print edition. Paste became a monthly with its August 2006 issue. For two years in the mid-2000s, Paste had a weekly segment on CNN Headline News called "Paste Picks", wherein editors would recommend new albums and films every Tuesday. In October 2007, the magazine tried the "Radiohead" experiment, offering new and current subscribers the ability to pay what they wanted for a one-year subscription to Paste. The subscriber base increased by 28,000, but Paste president Tim Regan-Porter noted the model was not sustainable; he hoped the new subscribers would renew the following year at the current rates, and the increase in web traffic would attract additional subscribers and advertisers. Amidst an economic downturn, Paste began to suffer from lagging ad revenue, as did other magazine publishers in 2008 and 2009. On May 14, 2009, Paste editors announced a plan to save the magazine, by pleading to its readers, musicians and celebrities for contributions. Cost-cutting by the magazine did not stem the losses. The main crux cited for the financial troubles is the lack of advertiser spending. In 2009, Paste launched an hour-long TV pilot for Halogen TV called Pop Goes the Culture. 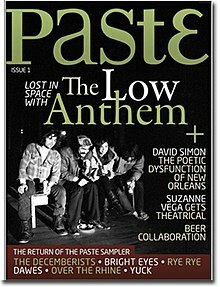 On August 31, 2010, Paste suspended the print magazine, but continues publication as the online PasteMagazine.com. From 2011-2016, Paste offered a digital subscription service, covering music, movies, TV, comedy, books, video games, design, tech, food and drink. Each issue included a digital version of the Paste Sampler with seven new songs each week. In 2017, Paste launched a new, large-format print magazine with an accompanying vinyl sampler. Initially planned as a quarterly, it now plans to release it annually. However, the 2018 issue was not delivered to subscribers. Its tagline is "Signs of Life in Music, Film and Culture". Paste's initial focus was music, covering a variety of genres with an emphasis on adult album alternative, Americana and indie rock, along with independent film and books. Each issue originally included a CD music sampler but was dropped in favor of digital downloading as a Going-Green initiative. Featured artists included Paul McCartney, Ryan Adams, Blackalicious, Regina Spektor, The Whigs, Fiona Apple, The Decemberists, Mark Heard, Woven Hand, Milton and the Devils Party, Liam Finn, The Trolleyvox, and Thom Yorke. Many of these artists also contributed to the Campaign to Save Paste. Paste added videogames coverage in 2006, and has since expanded to include television, comedy, comic books, drinks (primarily craft beer) and, most recently, politics. Paste has been recording live performances since 2006, first in its office in Decatur, Ga., and then in its Manhattan studio location beginning in 2012. Artists who've performed in the Paste studio include Steve Martin, Waka Flocka Flame, Violent Femmes, Minus the Bear, Flogging Molly, The Civil Wars, Chris Thile, Dashboard Confessional, The Zombies, Laura Marling, Puddles Pity Party, Arrested Development and Grace VanderWaal. Paste has also filmed exclusive performances at events across the country, including The Lumineers, Billy Bragg, Courtney Barnett, and Lord Huron at SXSW; Old Crow Medicine Show, Frank Turner, Of Monsters and Men, and Deer Tick at the Newport Folk Festival; and Jason Isbell, Cold War Kids, and Elle King at CMJ. In 2015, Paste added several collections of archival live audio and video to PasteMagazine.com and now boasts more than 100,000 performances available to stream for free on its site or the Paste Music & Daytrotter app, launched in late 2017. Available content includes performances from Prince, U2, The Rolling Stones, Aretha Franklin, The Zephyr Bones, Wilco, Radiohead and thousands more, along with everything recorded in the Paste Studio. In 2005, Paste was listed at #21 on the Chicago Tribune's list of "50 Best Magazines"; it appeared on the list again in 2007. Paste was also named "Magazine of the Year" by the PLUG Independent Music Awards in 2006, 2007 and 2008. In 2008, 2009 and 2010, Paste was nominated for a National Magazine Award in the category of General Excellence, and in 2010, associate editor Rachael Maddux' writings were nominated for Best Reviews. ^ a b "Masthead". pastemagazine.com. Retrieved November 5, 2018. ^ "About". pastemagazine.com. Retrieved November 5, 2018. ^ "Paste Magazine Acquired". pastemagazine.com. Retrieved November 5, 2018. ^ a b c d e Turner, Dorie (September 1, 2010). "Paste music magazine to stop print publication". San Diego Union-Tribune. Associated Press. Archived from the original on March 12, 2017. Retrieved March 12, 2017. ^ Lyons, Gabe (March 1, 2012). "The Next Christians: Seven Ways You Can Live the Gospel and Restore the World". Crown Publishing Group. Retrieved November 5, 2018 – via Google Books. ^ "Spotlight: Paste Magazine - The Christian Imagination". www.christianimagination.com. Retrieved November 5, 2018. ^ "Paste Succumbs to Debt, Suspends Print Magazine - Folio:". foliomag.com. September 1, 2010. Retrieved November 5, 2018. ^ "Josh Jackson - Paste Magazine Journalist - Muck Rack". muckrack.com. Retrieved November 5, 2018. ^ Sturdivant, Jim. "My (Re)generation: Paste's Nick Purdy on the Fall and Rise of a Music Magazine". pubexec.com. Retrieved November 5, 2018. ^ "Paste Magazine Puts All Bets On The Internet". www.wbur.org. Retrieved November 5, 2018. ^ "McClatchy names Regan-Porter as new South region editor". apnews.com. June 12, 2018. Retrieved November 5, 2018. ^ Regan-Porter, Tim (January 17, 2018). "Part 1: My long journey to Stanford". medium.com. Retrieved November 5, 2018. ^ "Paste Magazine Thrives Through Belt-Tightening". adweek.com. Retrieved November 5, 2018. ^ "Following Radiohead, Paste to Let Subscribers Name Their Own Price". FolioMag. Retrieved May 17, 2009. ^ "Paste President: Radiohead Experiment 'A Huge Success'". FolioMag. Retrieved May 17, 2009. ^ Nolan, Hamilton. "Paste Magazine Freelancers Are Getting Screwed". gawker.com. Retrieved November 5, 2018. ^ "Paste Launches Campaign to Save its Magazine". FolioMag. Retrieved May 17, 2009. ^ "Decatur Metro » Inside the Death of Paste". archive.org. September 15, 2014. Retrieved November 5, 2018. ^ Jackson, Josh (October 26, 2009). "New Paste TV Show Debuts Tonight!". Paste. Retrieved November 7, 2013. ^ "Paste Magazine". Decatur Metro. September 29, 2015. Retrieved November 5, 2018 – via archive.org. ^ "Paste Magazine Is Returning To Print". AdWeek. Retrieved December 5, 2016. ^ "Paste Quarterly". Indiegogo. Retrieved November 5, 2018. ^ "Signs of Life in Music, Film and Culture". Paste. Retrieved May 17, 2009. ^ "Milton & The Devils Party". Discogs. Retrieved November 5, 2018. ^ "Fountains of Wayne, Joe Craven, Milton and the Devils Party, Jon Rauhouse". pastemagazine.com. Retrieved November 5, 2018. ^ "Milton & the Devils Party - Biography, Albums, Streaming Links - AllMusic". AllMusic. Retrieved November 5, 2018. ^ "'Save Paste' Campaign Raises $166,000". FolioMag. Retrieved May 21, 2009. ^ "Paste Cloud: A Q&A with josh Jackson". The PreludePress. Retrieved December 23, 2015. ^ "50 Best Magazines". Chicago Tribune. June 17, 2004. Retrieved May 17, 2009. This page was last edited on 29 January 2019, at 22:01 (UTC).